Qingming Festival, also known as 'Tomb-Sweeping Day' or 'Pure Brightness Festival,' is a traditional Chinese festival that falls in early April every year, on the first day of the fifth solar term of the traditional Chinese lunisolar calendar. This year, it falls on April 5. Qingming became a public holiday in mainland China in 2008. As the name implies, on this day, Chinese people usually visit their ancestors' graves, burn offerings to honor the dead or have an outing to enjoy the beauty of spring. Qingming originates from 'Hanshi Jie' (Cold Food Festival) as a memorial to Jie Zitui, a loyal retainer of Duke Wen of Jin during the Spring and Autumn period (from approximately 771 to 476 BCE). Jie followed and supported Duke Wen throughout his years of exile. Once, when they could not find anything to eat, Jie was said to have cut his own flesh to boil a meat soup to feed the starving Duke Wen. When Duke Wen came into power, Jie chose to retire and become a recluse in the woods. Duke Wen needed to pick Jie's brain, so he decided to seek him out. But how could he find a man hiding in the depths of the woods? One of his retainers suggested he set a fire to force Jie out — terrible advice which Duke Wen took. Tragically, Jie and his mother died in the fire. The next year, Duke Wen led his retainers to climb the mountain and paid homage to Jie's grave. He was thrilled to find the willow tree was still flourishing. He named the tree the 'Qingming willow,' and the day afterwards officially became known as the 'Hanshi Qingming Festival.' Later, the two festivals were combined. The festival later became a more general day to honor deceased ancestors during the reign of Emporer Xuanzong in the Tang Dynasty. Xuanzong sought to crack down on wealthy Chinese citizens honoring ancestors with extravagant and ostentatious ceremonies, so in 732 CE he declared that such festivities could be formally paid just one day per year — Qingming. One of the best-known Chinese paintings is Qing Ming Shang He Tu (清明上河图) “Along the River During the Qingming Festival” by Song Dynasty (960-1126) artist Zhang Zeduan, a panoramic capturing the commotion of people in Song period capital city Bianjing, modern day Kaifeng, Henan. The picture depicts the custom of Taqing (踏青) "treading on the greenery," which continues to this day. The festival also signifies the changeover of the season from winter to spring, so people believe it is the perfect time for an outing, and also to plant seeds for plants or trees. 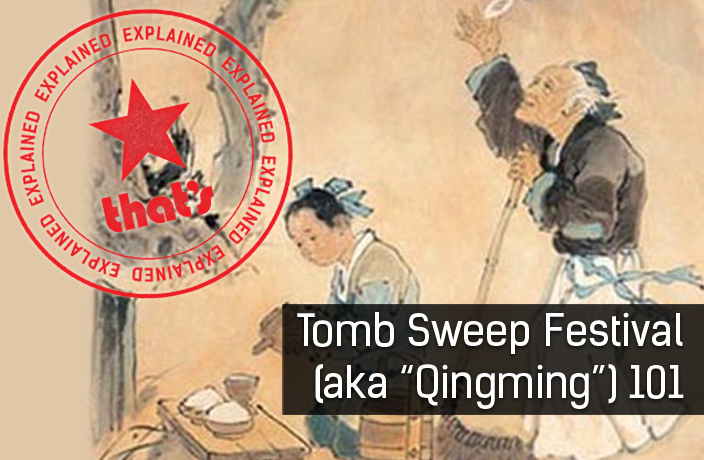 Of course, the main activity of Qingming is tomb sweeping. Generally, people visit their family cemeteries, and offer food, flowers and favorite items of the dead. If the cemetery regulations allow it, they will burn paper money and incense before the tombstone. 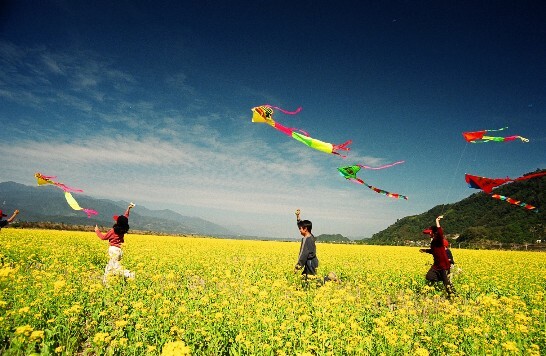 Chinese people also like to fly kites during Qingming Festival. That's because people in ancient times believed that on Qingming, the gates of hell were open, which meant that they could send their greetings to the departed by kite. These days people cut their kites loose when flying them in hopes that it will bring them good luck in the new year. Traditionally, people do not light a fire or cook, but eat only cold food during Qingming. These days, several Qingming snacks are enjoyed by Chinese people. 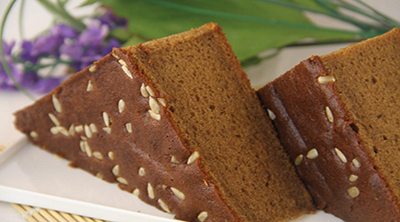 In the north, people eat precooked cold food like jujube cakes, barley cakes, etc; and in the south, qingtuan (green rice balls made of rice flour and wormwood juice) and sweet-scented sugar lotus root stuffed with sticky rice are common refreshments. This article originally appeared on Thatsmags.com in April 2016. It has been updated and republished on April 4, 2019.